Time lapse video of movement at landslide toe. Video taken by KUTV2News. 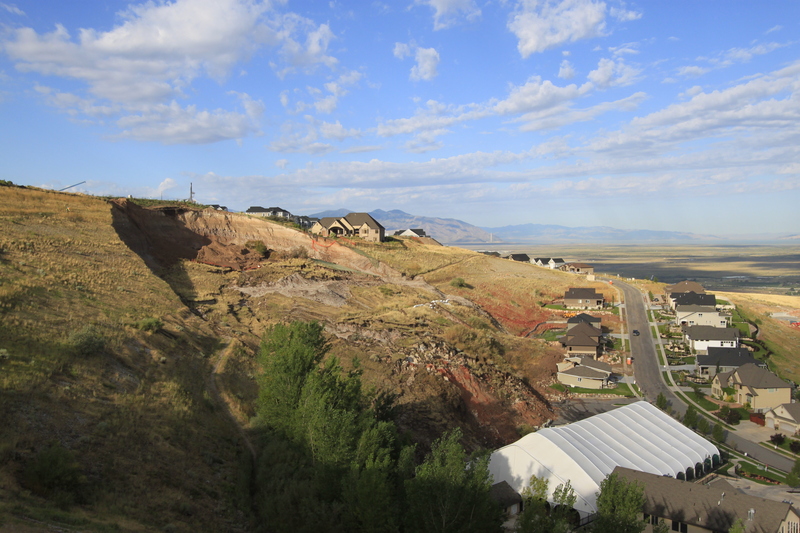 Parkway Drive landslide, North Salt Lake, view toward west, August 14, 2014. The landslide damaged the Eagle Ridge Tennis and Swim Club (white tent structure), severely damaged one house (directly above the tent structure), and removed part of the backyard of a second home. 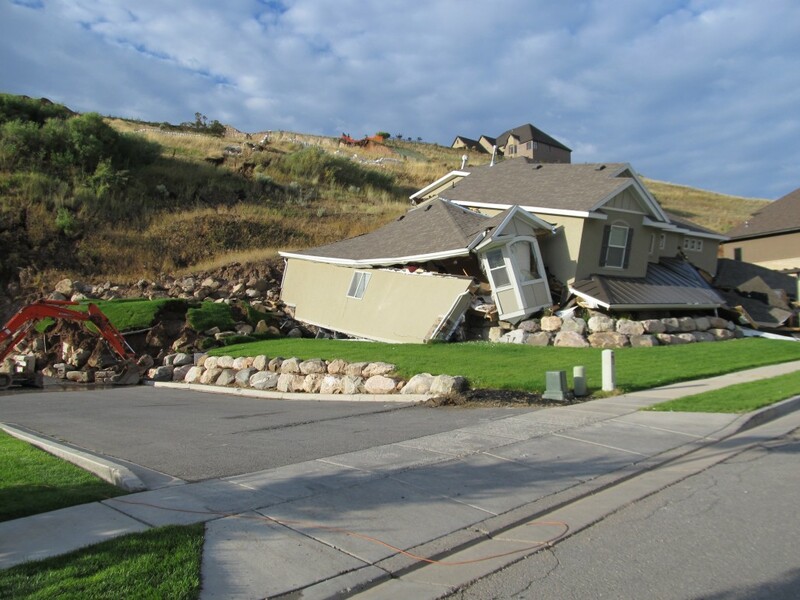 At about 6:00 a.m. the morning of August 5, 2014, a large landslide occurred above Parkway Drive in the City of North Salt Lake, Davis County. The landslide involved a engineered slope that had been part of an aggregate mining operation in the 1990s, but has since been reclaimed and partially developed into the Eaglepoint subdivision. This web page is intended to provide relatively frequent updates on landslide conditions, including surficial movement amounts, changes in rate of movement, and UGS activities related to this landslide. The data presented here are provisional and subject to revision. The catastrophic failure of the reclaimed slope above Parkway Drive resulted in a 60-foot-high main scarp above a landslide mass about 500 feet wide and 500 feet long that moved downhill several tens of feet. Preliminary estimates suggest a landslide volume of 300,000 to 400,000 cubic yards, based on an assumed depth of between 30 and 50 feet. The pre-slide slope had a local relief (change in elevation) of about 200 feet and an average grade of approximately 45 percent (the ground rises 45 feet over a distance of 100 horizontal feet). UGS geologists documented other small shallow landslides at the base of this slope in the mid-2000s. The upper part of the slope is coincident with the Lake Bonneville highstand shoreline (approximately 18,000 years ago) and is underlain by Lake Bonneville sands and gravels that overlie Tertiary-age (66 to 2.58 million years ago) tuffaceous sediments (volcanic sediments that commonly weather to clay). Development in the Eaglepoint subdivision, which surrounds the slope, includes construction of several houses along the south side of Parkway Drive at the bottom of the slope and preliminary earthwork related to building lot development at its crest. Only one house and a tennis facility were directly impacted by the landside. A home at 739 Parkway Drive was pushed off its foundation and destroyed, and the southeast corner of one of the tennis court facilities at the Eagle Ridge Tennis and Swim Club was pushed by the toe of the landslide, but remains erect despite having undergone structural damage. In addition, a small portion of the backyard at the residence along the left flank of the landslide, and a recreational trail that crossed the slope were carried away by the landslide. For a short time after the slope failure, 27 homes were evacuated while the landslide was evaluated by city officials, consultants, and the UGS. As part of the response to the original slope failure, the Parkway Drive landslide was remediated from April to December of 2015. The remediation included regrading much of the slope to lower its overall steepness, and installation of a drainage system to collect water from the slope and transport it off the landslide to the local storm drain system. However, parts of the lower portion of the landslide were not remediated due to on-going legal issues. During reconnaissance visits to the site beginning in spring 2016, we observed several features that suggest reactivation of two parts of the lower portion of the original landslide. 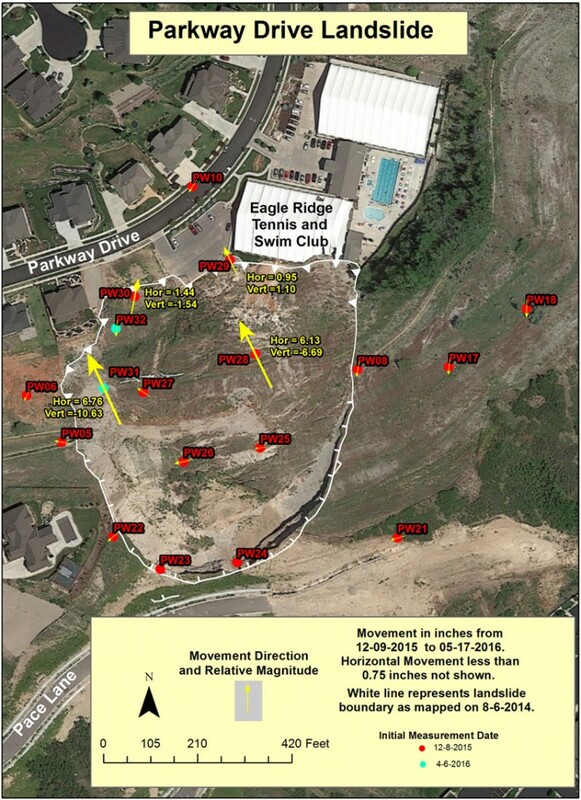 These reactivations include a failure of a steep slope above the home at 745 Parkway Drive, which we have named the Western slide, and a larger failure above the parking lot and tent associated with the Eagle Ridge Tennis and Swim Club that we are calling the Eastern slide. 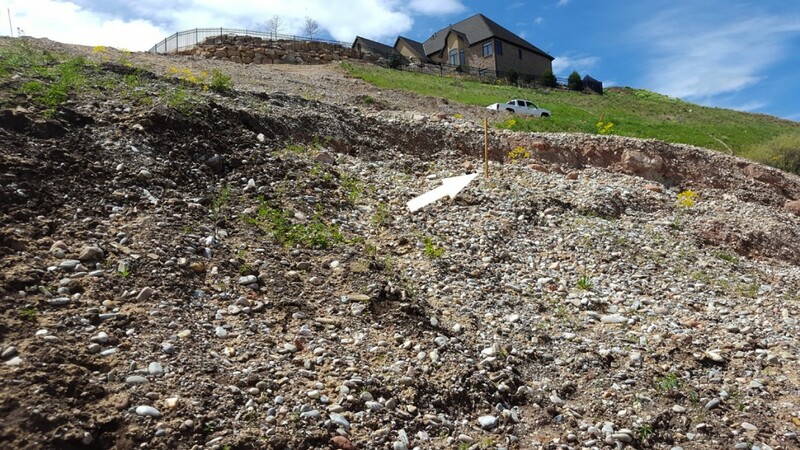 A part of the original 2014 landslide located behind 745 Parkway Drive that was not remediated apparently reactivated shortly after local snow melt in 2016, based on reports from local homeowners. This slope failure was documented by the UGS on March 9, 2016, during a regular site visit to observe monitoring wells and collect groundwater data. As of May 17, 2016, the Western slide is about 70 feet wide and extends about 90 feet from scarp to toe. Surface features suggest no additional areal expansion since our first observations in March; however, monitoring point PW31, installed just downhill of the scarp has recorded continued downslope movement. During our GPS monitoring visit on April 6, 2016, we observed features that suggest a reactivation of part of the original slide above the tennis court parking lot and tent. This movement is occurring on a steep slope that marks the toe of the original landslide. Since our initial observations, the main scarp of this reactivation has grown to an estimated 6 to 7 feet in height. 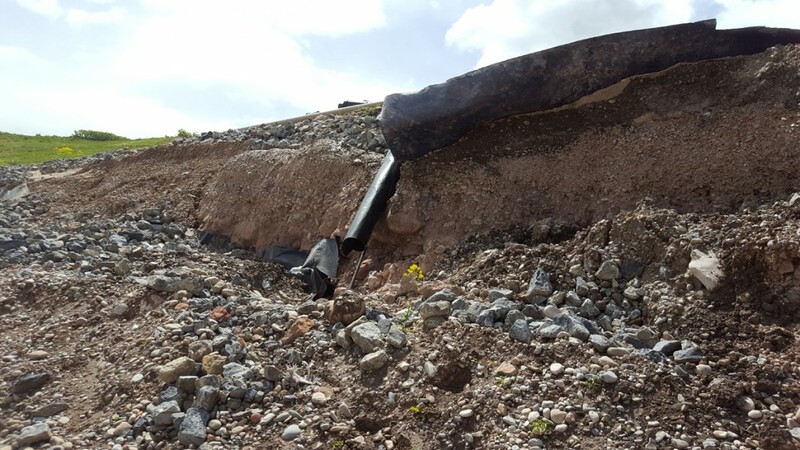 Extension at the scarp has resulted in separation of a drainage pipe designed to carry water off the landslide to the local city storm drain system in Parkway Drive. The main scarp extends some distance downslope along the western flank of the failure where it transitions to ground cracking. On April 6, the open portion of one of the ground cracks along the western flank was measured to be about 10 feet deep, suggesting a possible deep seated reactivation, perhaps along the original landslide basal slide plane. In addition to the main scarp, we have observed abundant ground cracks and minor internal scarps near the top of the steep slope above the tennis court parking lot and tent. This slope represents a non-remediated portion of the toe of the original landslide. Water was observed flowing onto the parking lot from the landslide toe. 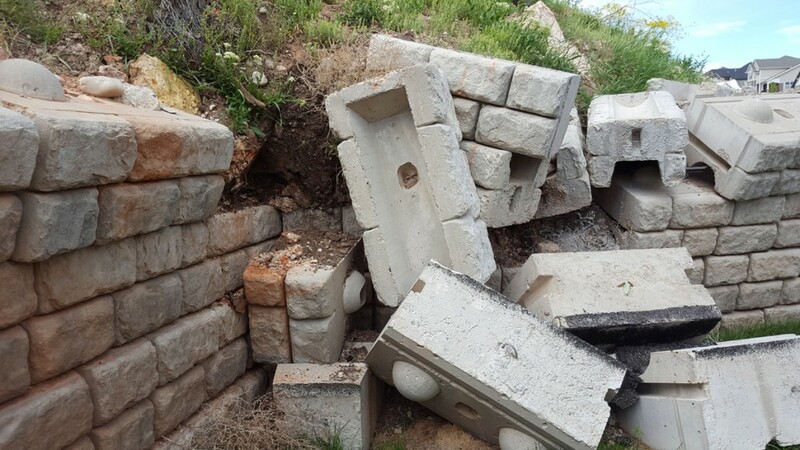 Additional evidence of movement includes boulders displaced from the toe that have impacted the tent and toppling of individual concrete blocks that are part of a retaining wall at the base of the toe. Small ground cracks observed above the main scarp suggest possible headward extension of this reactivation. Due to these reactivations, we have increased the frequency of our GPS monitoring and expect that future landslide and weather conditions will dictate future monitoring frequencies. 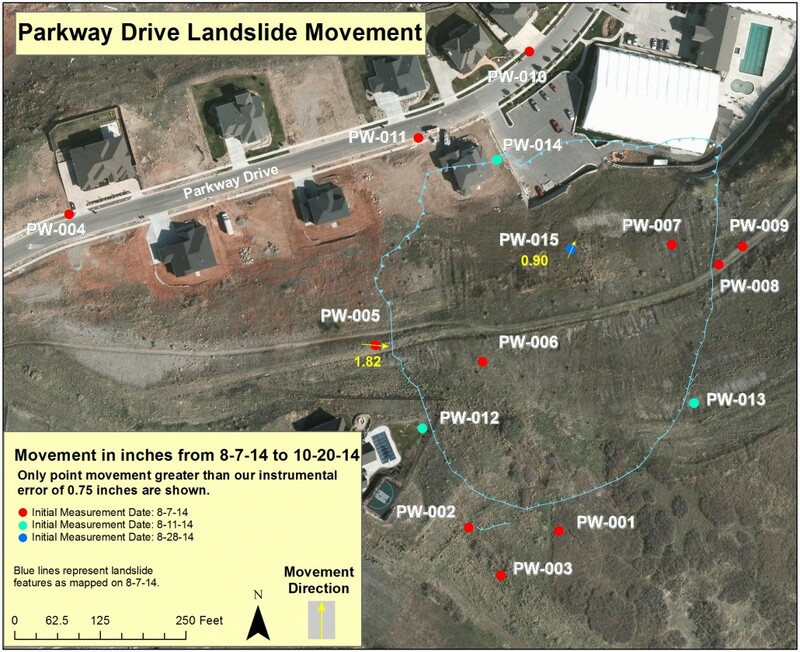 Additional information related to the Parkway Drive landslide and development in the area, including geotechnical reports, reconnaissance photos, videos, and other data are available for download from the UGS GeoData Archive System. Contact either Gregg Beukelman, 801-537-3380, email: greggbeukelman@utah.gov or Rich Giraud, 801-537-3351, email: richardgiraud@utah.gov.